Like many of you, we are shocked and hurt by the result of the presidential elections. But, it the midst of all the uncertainty and all the pain this election has caused our immigrant community and many others, there is still hope. We will not give up! We will not give in to fear! We will stand with our immigrant community until we are all treated with respect and dignity. And we need you more than ever to stand with us! In the coming weeks, we’ll plan and provide more information about our next steps, please stay tuned. Perhaps the best indicator of the hope we have comes from the election result in our backyard, House District 22, Oregon’s first minority majority district. Despite all divisive talk about immigrants that swung the presidential election, we got the first Latina immigrant (Teresa Alonso Leon) elected to the Oregon Legislature. This didn’t happen by accident. Like in many other communities across the country we organized. We organized. We organized. And we organized some more. Together with Teresa’s campaign staff, we knocked on over 35,000 doors and provided ballot assistance to over 400. The result—Teresa won with 55% of the vote, more than incumbent Democrat had received since the 2008 Democratic wave. And she’s not alone. 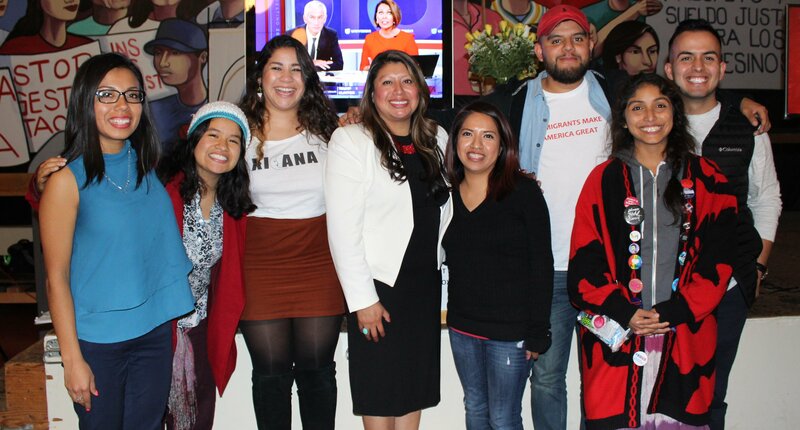 Laura Isiordia, an immigrant and long-time leader in our movement, was recently appointed to the Woodburn School Board. Melinda Veliz, a daughter of immigrants, was elected to the Woodburn City Council. And Diego Hernandez, a son of immigrants, was elected State Representative for Oregon’s House District 47. This is the future. This is our destiny—to lead. We owe it to our brothers and sisters that came before us. To those that risked and lost their lives to be here. To those who that have fallen into the traps of our society and have landed in the wrong places. But, we also owe it to the ones that will come after us. They deserve a better a start than the one we’ve had. So while we mourn, let’s not lose sight of our future. La lucha sigue (the struggle continues). P.S: Support farmworkers! Join us at our Annual Celebration next Thursday 11/17!